After a quick breakfast in Deer Lake, we headed off to Norris Point under gray skies. A picnic area on Bonne Bay just outside Norris Point beckoned us, and we pulled over to take a closer look at the shoreline, and watch the wind inspired whitecaps out on the water. Our plan for the day originally called for us to do the boat tour on Western Brook Pond, but my dislike for wave action persuaded us to consider that option for the next day. Instead, we checked into our inn, and drove down to the Norris Point waterfront to stretch our legs. We enjoy visiting cemetaries and if time permits, allow ourselves to wander amongst the tombstones and learn about the prominent families of the area, life expectancies, and sometimes the circumstances surrounding their demise. 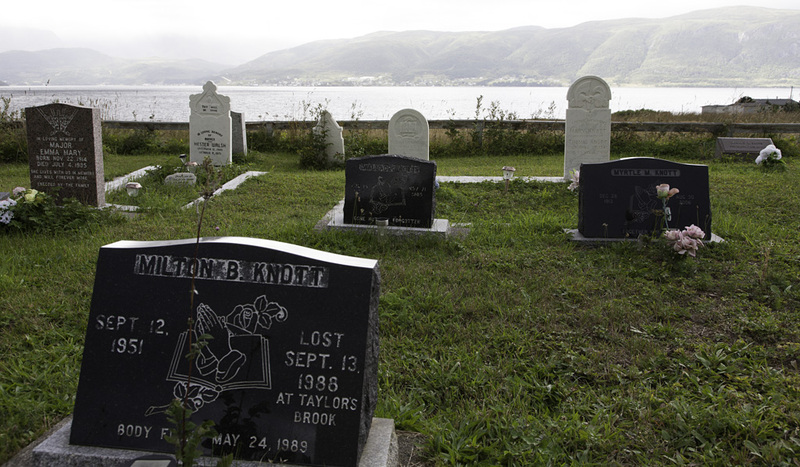 While in Norris Point’s cemetary, we saw a poignant reminder that to be lost at sea has several possible outcomes: lost forever, lost with immediate recovery, and lost with delayed recovery. Mr. Knott’s tombstone (pictured) tells the story of his demise, and of the 8 month wait before the sea returned his body. Stories like his nurture the feelings of respect that we have for the power of the oceans, and the hope that families have to be reunited with their loved ones. After walking along the waterfront in Norris Point, we headed out to Lobster Cove Head to visit the beach and lighthouse. 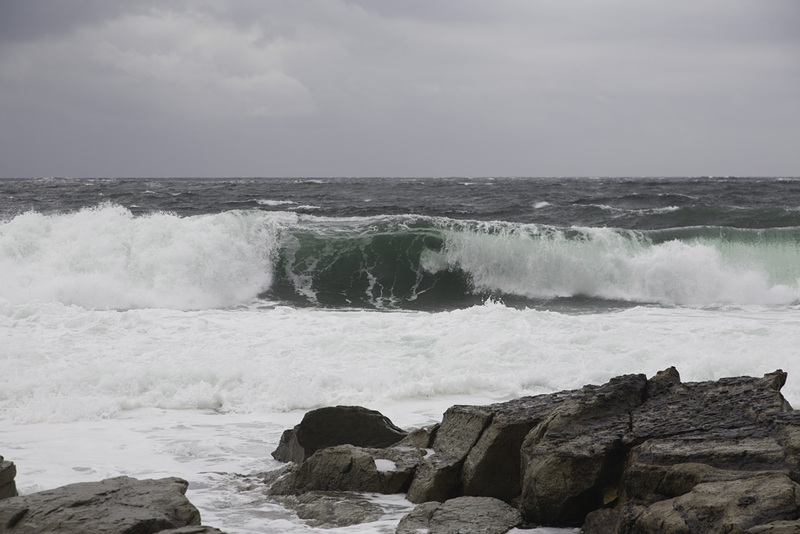 There was a lot of wave action this day, and we contented ourselves with being still and watching them roll in. A steep staircase on the left side of the lighthouse leads you down to a small beach. Public access to the lighthouse is limited to the main floor where one can see displays related to the arrival of early settlers to the area. On our second full day in the area, we chose to drop by the Norris Point Lookout before heading to Rocky Harbour to purchase our boat tour tickets for Western Brook Pond. With tickets in hand, we had time to kill and decided to visit the wreck of the SS Ethie (click here to hear Graham Wells’ song about the accident). We made our way to the boat dock at least a 45 minutes ahead of the departure time, and were glad we did so. It was a beautiful day, and ticket sales were strong. Our arrival time assured us of good seating on the upper deck. The leisurely pace of our day also afforded us an opportunity to poke around Rocky Harbour before dinner time. Driving and parking at the end of Main Street South allowed us to find a path on the left to an overlook with views out over the Gulf of St. Lawrence. 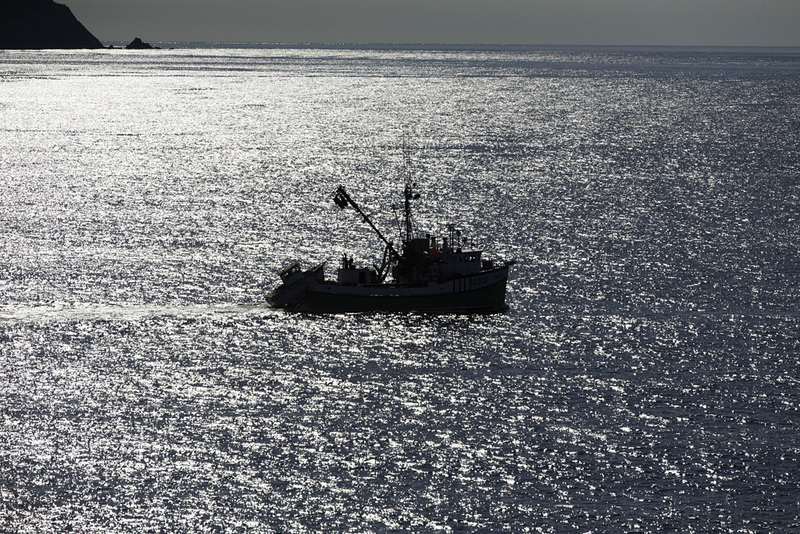 Here we spent some time watching fishing boats go by, and generally enjoying the seascape in front of us. We capped off this day with a walk on the Coastal Trail before heading back to Norris Point and the end of Clarke’s Road in time for a beautiful sunset. It was during our sunset watching in Norris Point that a young boy approached us and brought to our attention a salt ship that was waiting at the edge of the bay for a favourable tide to make it’s important delivery. Our conversation that evening provided me with the motivation to head out early the next morning to witness the unloading of the vessel. Our third day started with me slipping away to see the action dockside. 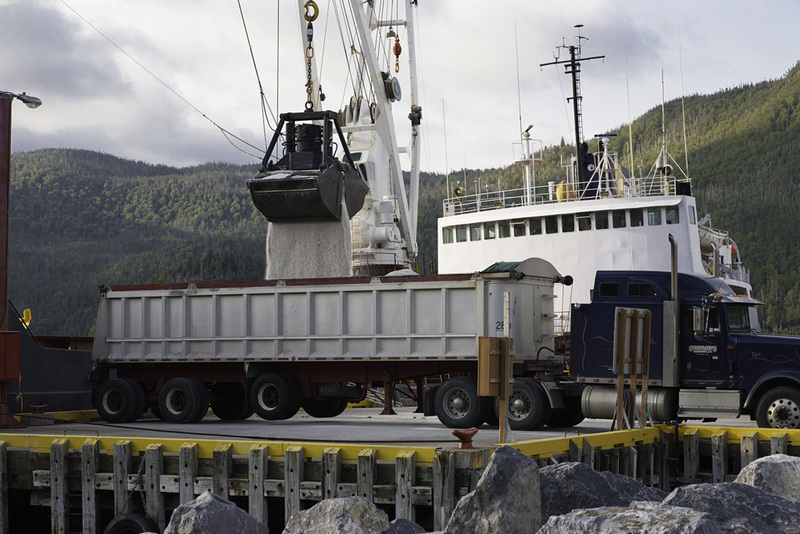 Getting to the dock requires navigating very narrow streets through the town of Norris Point. I was impressed to see the number of trucks, the staging area set up on Pond Road near Neddy Harbour, and the signal man orchestrating the comings and goings of the trucks to avoid traffic congestion near the dock – this was a tightly orchestrated unloading operation! With my little side trip behind us, we had breakfast, then headed off to Twillingate to see the icebergs, and Port Rexton for our next stop.